River Plate have earned a shot at the forthcoming Copa Libertadores – the top South American cup tournament. River won their first title in the knockout competition courtesy of a hat trick from striker Lucas Alario. Rosario Central were ahead but River Plate stole the victory to end the game 4-3 on Thursday. 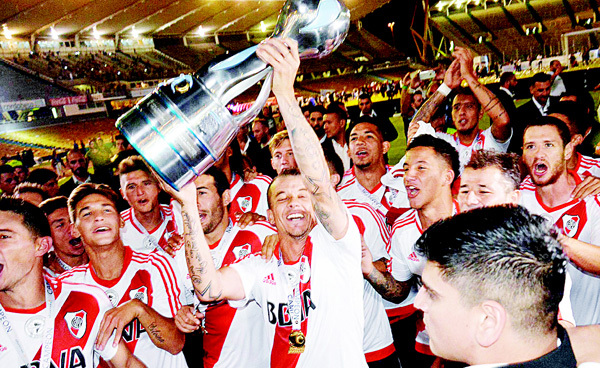 River Plate would have another shot at the Libertadores – a tournament they won for the third time last year. They are the favourites to lift the title for the fourth time. Rosario were pained by the loss especially after going up first. They have finished in second place for three years now. They lost the final to Huracan two years ago before losing to Carlos Tevez’s side Boca Juniors last year. This term they led after 30 minutes courtesy of goals from Damian Musto and Marco Ruben. They were ecstatic with victory staring them in the face. However, two goals from Alario via spot kicks quickly cancelled their lead. Striker Ruben got another goal in the second half to give Central the lead again. Alario got another for River and substitute Ivan Alonso got the winner. The victory was well received after River’s 4-2 home loss to Boca in the Superclassico over the weekend. The victory over Central could mean $five million for River Plate. Under Coach Marcelo Gallardo, it is the sixth title though it is the first in a domestic competition in two years. Taking $1 to 15.95 Argentine Pesos, the club could rake in 80 million Pesos, according to La Nacion. The seven goal thriller was pure spectacle that provided respite following a gloomy situation in South America at the moment.